Did you know that April is Rosacea Awareness Month? The National Rosacea Society (NRS) created this awareness month to educate the public on the chronic (but treatable!) facial condition that affects an estimated 16 million Americans or more. What Exactly is Rosacea? Rosacea is a skin disease that typically shows one or more of the following signs and symptoms: • Redness on the cheeks, nose, chin or forehead • Small, visible blood vessels on the face • Bumps or pimples on the face • Watery or irritated eyes While rosacea can affect anyone, people who have fairer skin and who tend to blush or flush easily are at a higher risk. Genetics can also play a big factor as well, such as those with British, Celtic, Eastern European, Asian and Native American heritages. Although stressful situations, weather changes or irritating products can affect your complexion, it’s important to know the symptoms of rosacea to make sure that preliminary signs are not dismissed. If occasional redness becomes more common, there’s a chance that it may become permanent, eventually leading to rosacea. When this happens, blood vessels become more apparent, and some people experience burning, stinging and bumps on the face. How Can You Treat Rosacea? Even though there are no cures for rosacea, there are many options to reduce the visibility and treat the irritation. Sometimes rosacea flare-ups are unavoidable, so it’s important to keep a few products handy that can help calm and soothe the skin. Anti-inflammatory topical ingredients are effective to help reduce the appearance of redness. In addition, keeping your skin hydrated and protected from the sun can help control the flare-ups. Always make sure to apply broad spectrum SPF to keep your skin protected. 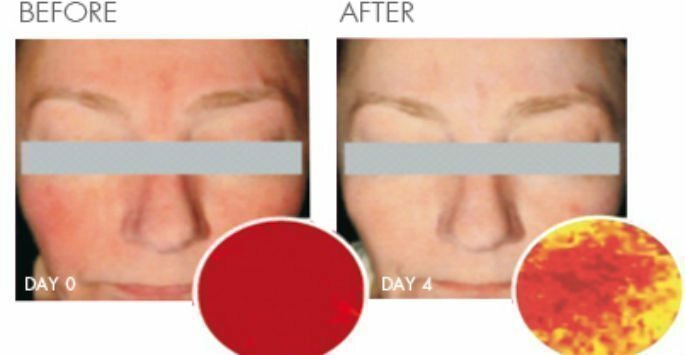 ReFresh Can Help with Rosacea ReFresh Aesthetic Center provides both treatments and non-prescription products that can help improve rosacea, such as Sciton’s BBL and vascular treatments, gentle PCA peels and Avene’s antirougeurs products. Should the rosacea effects go beyond what our practitioners can address, we have resources to refer you to a dermatologist to treat the condition. If you’d like to schedule a complimentary consultation, simply give us a call at (414) 964-1111.